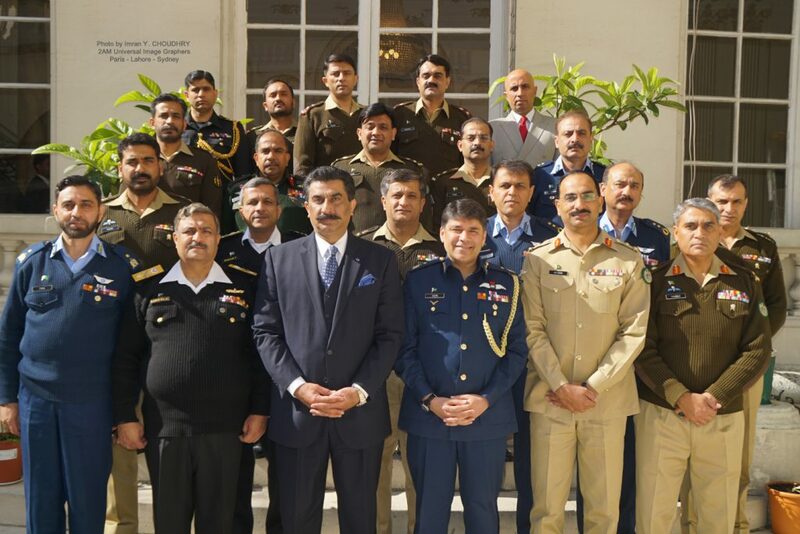 A delegation of National Security War course from National Defence University, Islamabad, a premier institution entrusted with the responsibility of training the future Military and Bureaucratic leadership of Pakistan visited the Embassy on 02 May 2016. 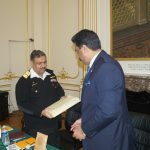 Commodore Babar Bilal Haider, Senior Directing Staff Chief of National Defence University, Islamabad along with other members of the delegation made a call on to the Ambassador H.E. Mr. Ghalib Iqbal, Ambassador of Pakistan to France and Monaco and Permanent Delegate of Pakistan to UNESCO for a detailed interactive briefing on Pakistan-France Relationships. The participants asked questions and showed keen interest in the briefing. The delegation will visit several French Government policy institute, Ministries and interact with French Think tanks a part of their study tour abroad. 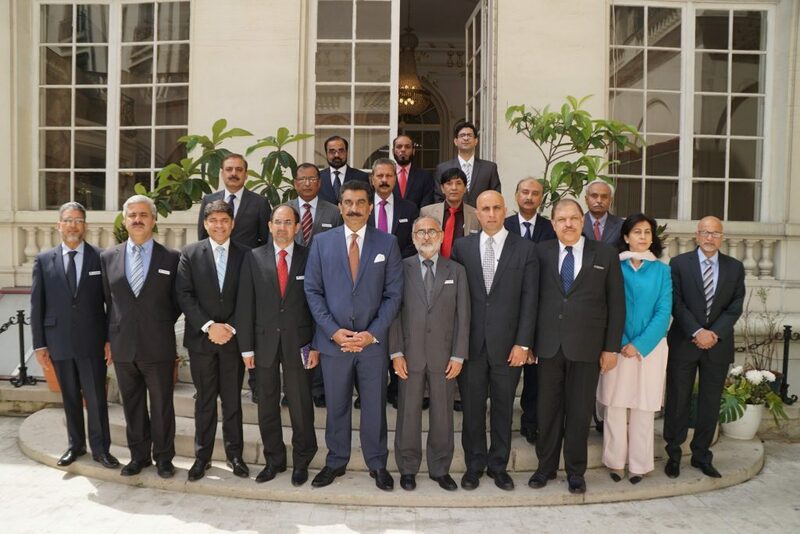 A delegation of National School of Public Policy, a premier institution entrusted with the responsibility of training the bureaucrats of Pakistan visited the Embassy on 16 May 2016. Mr. Shafiq Hussain Bokhari, Chief Instructor of National School of Public Policy along with other members of the delegation made a call on to the Ambassador H.E. Mr. Ghalib Iqbal, Ambassador of Pakistan to France and Monaco and Permanent Delegate of Pakistan to UNESCO for a detailed interactive briefing on Pakistan-France Relationship. The participants asked questions and showed keen interest in the briefing. Later in the evening, a dinner was hosted by the Ambassador at Embassy Residence in the honor of visiting delegation of National School of Public Policy. The delegation during their stay in Paris will visit several French Government institutions and interact with think tanks including Ministry of Foreign Affairs,Finance , Economy and Trade, National Assembly and French School of Administration as a part of their study tour abroad. 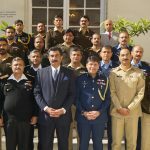 La Reunion, France, March 19, 2016: Governor (préfecture) of the French Island De La Réunion while meeting with Pakistan Navy officers stated that France and Pakistan enjoy very friendly and cordial relations and visit by Pakistan Navy Warship PNS ASLAT would further strengthen that. He briefed the officers about the diverse nature of communities living in the island and the state of harmony existing between them. Pakistan Navy’s warship ASLAT entered de La Réunion Saturday on a three days visit. 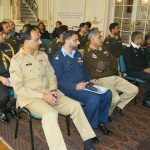 The officers of Pakistan Navy on-board the ship will hold discussions and will interact with high ranking officials of French Navy, civilian officials and political leaders of the on the subjects of mutual interest. The ship would carry out exercises with French Navy at the end of the visit. 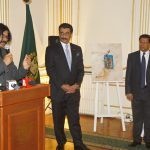 Embassy of Pakistan, Paris arranged an exhibition of renowned Canadian-Pakistani artist Fahim Hamid Ali here this evening. 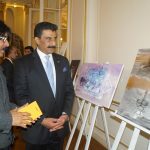 Speaking on the occasion, the Ambassador of Pakistan to France H.E Mr. Ghalib Iqbal said that he had observed as a Diplomat working in different countries that Pakistani artists living abroad had a unique angle and approach towards arts. He paid glowing tributes to the canvas and variety of the subjects that the artist had dealt with. He said that where-ever Faheem’s art goes, the name of Pakistan travels with him. Mr. Fahim himself spoke about his inspirations, his journey towards perfection, the subjects he dealt with and his future plans. The Ambassador of Sri Lanka in France H.E. MR. Tilak Ranaviraja, who himself is a painter, attended the exhibition as special guest. He also spoke on the occasion. 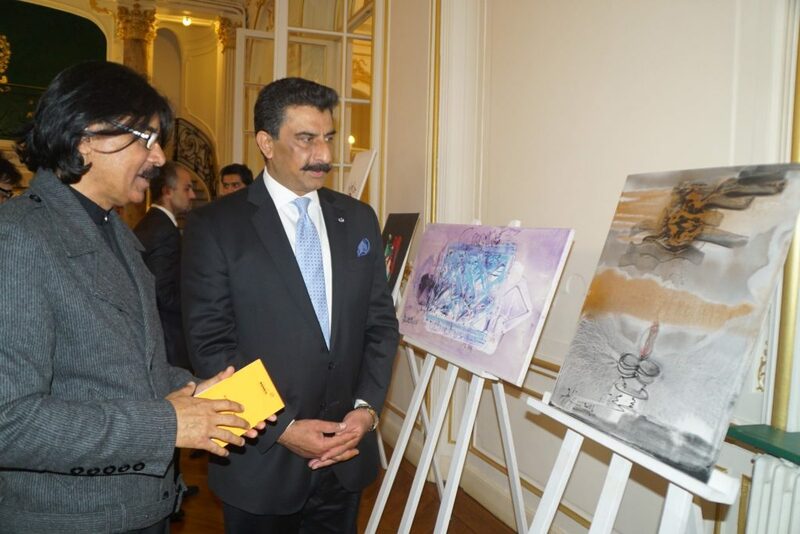 He appreciated the work of the artist and felicitated the embassy of Pakistan in Paris for holding this exhibition. Mr. Fahim Hamid Ali emerged on the art scene about two decades ago when he started his first exhibitions. Gradually, he expanded the horizons of his work concentrating on images from his culture and roots. He does not limit his expressions to calligraphy alone. He paints landscapes, still life and Mughal miniature. Despite working in various directions, the work remains that of Ali. His signature is obvious through his corded lines. He creates stain glass painting effects on canvas with his thick lines. Soon Ali earned a name in stain glass painting. Ali remains busy painting, decorating homes and holding exhibitions around the world. His successful exhibition at the Lionel Gallery in June 1996 was talk of the town for some time. 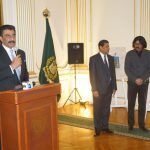 He met another success when he exhibited his figurative works and Islamic calligraphy in mixed media at Singapore in 1998. In Canada, he held his first solo exhibition showcasing floral designs, landscapes and calligraphy in mixed media at a private residence in March 1999. Now Ali is a known name in the art circles of Toronto. He is specially asked by the art galleries there to lend his works for display and sales. The Pakistan Canada Association asks him to participate in its multicultural festivals. Ali is a profound believer in communication. For the purpose, he has chosen an international language of form, colour and line. He generally works in mixed media on paper and canvas. He also is at ease with the wash painting technique where he works with liquid oil paints flowing like water. He seldom uses a brush; instead, he uses his finger to paint. He does not confine himself to a specific technique. He works with freedom of thought, and medium. That gives him an opportunity to also use defined strokes and accidental textures in his work. A play with colour makes the end result a visual pleasure. In the last five years, Ali has been experimenting at various levels. He created pottery as a base for his script. His hand-painted pots made headlines in the country’s news. Then as an experiment he wrote Arabic in vertical lines. Throughout his career as an artist, he has been traveling around the world. Wild life is another filed where he excels. With love of nature, innate in character, he has a mastery over presentation of wild life in impressionistic technique. Over the years, Ali has also done thematic paintings. He has also painted on the French Revolution and Sultan, a historical hero of the sub-continent. The best thing about Ali’s work is that he is always experimenting with something new. Ali’s interior designing is unique, as he likes to create harmony through new ideas. He believes in breathing life into every comer of the house he is working on. Large number of French art lovers, diplomats, intellectuals, public figures and journalists witnessed the exhibition and appreciated his work. 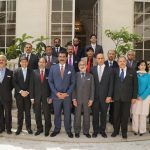 Paris, May 03, 2016: The 12th round of Pakistan-France bilateral political consultations at the Foreign Secretary level was held here yesterday. The Foreign Secretary Mr. Aizaz Ahmad Chaudhry led the Pakistan delegation while the French side was led by Mr. Christian Masset, Secretary General of Foreign Affairs. A wide range of bilateral and multilateral issues were discussed during the meeting. 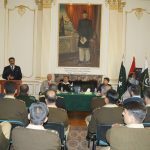 The Foreign Secretary gave an overview of Pakistan’s internal situation including notable achievements by the Government to improve law and order, stabilize the economy and overcome the energy crisis. 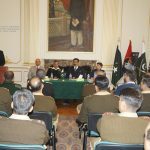 He briefed his French counterpart on significant role played by Operation Zarb-e-Azb in achieving success in the fight against terrorism and wide ranging National Action Plan to address the root causes of terrorism in the country. Foreign Secretary Aizaz Ahmad Chaudhry also briefed the French side on Pakistan’s foreign policy priorities, particularly efforts to facilitate an intra-Afghan process of political reconciliation. France appreciated Pakistan’s positive role in peace efforts in Afghanistan. Both sides acknowledged the need to work together to address the continuing threat of terrorism and radicalization, which had affected both Pakistan and France. The Foreign Secretary emphasized that closer cooperation was required between all countries on the issue of terrorism, since it is a global problem. Recent developments in the region were also discussed. The French side highlighted the challenges confronting France and the European Union. Both sides agreed to work actively to enhance the existing level of bilateral trade of US$ 1.5 billion per annum, which was not commensurate with the size of the two economies. The positive role played by the European Union’s GSP Plus facility in promoting trade links was also noted. The two countries would encourage their respective private sectors to take advantage of the investment opportunities on offer in both countries. During the talks, both countries also held extensive discussions to strengthen bilateral cooperation in higher education, cultural exchanges, science and technology and defense and security. It was decided to hold the next round of bilateral political consultations in Islamabad next year. Besides the consultations, the Foreign Secretary also held meetings with Mr. Jacques Audibert, Diplomatic Adviser to the French President and Mr. Louis Gaultier, French Secretary General for Defense and National Security.